Samsung definitely prepares to launch another smartphone, but this is likely to be a sequel to the 2017 Galaxy Sport rather than the 2018 Galaxy Watch, even though its market name is very similar to the latter. The unannounced Samsung Galaxy Watch Active will most likely focus on health and fitness features, which will also translate in a more reasonable price. 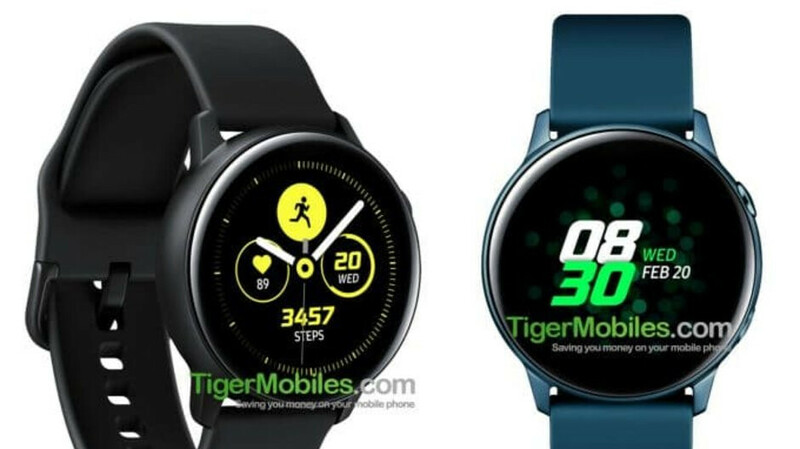 If you haven't followed the news, you're probably unaware that the first images of the upcoming smartwatch, published by TigerMobiles, popped up online a couple of days ago. However, they weren't followed by any information about the smartwatch's specs. The good news is the folks over at XDA Developers have found most of its specifications and features in the Galaxy Watch Active's firmware files. There are considerable differences between the Gear Sport and Galaxy Watch Active, but that's quite understandable considering that two years have passed since the former made its debut on the market. First off, the Galaxy Watch Active will be equipped with a much better Exynos 9110 chipset, the same that powers the current Galaxy Watch model. The Galaxy Sport model features slower the less power-efficient Exynos 7270 chipset inside. Also, the upcoming Galaxy Watch Active seems to sport a bigger 1.3-inch display (360x360 pixels), as opposed to the Galaxy Sport's 1.2-inch screen. But the most intriguing piece of information obtained by XDA Developers concerns the battery inside the Galaxy Watch Active. Apparently, Samsung Galaxy Watch Active will pack a small 230 mAh battery, whereas the Galaxy Sport has a much larger 300 mAh battery inside. Now, it's possible that the Galaxy Watch Active will be available in different sizes and the smaller version could pack a not so great battery, just like the Galaxy Watch. If that's the case, then it would make perfect sense for the larger Galaxy Watch Active model to pack a larger battery, just like the Samsung Galaxy Watch. Even so, it's a bit scary that Samsung has decided to go with such a small battery inside a product that's mostly known for its low battery life. Other features that we've been able to learn about including Bluetooth 4.2, NFC (Near Field Communication), LTE support, Bixby, a heart rate monitor, as well as some health and fitness features like pedometer, stress and sleep monitor, barometer, gyroscope and gravity sensor. Unfortunately, just like the previous Samsung smartwatches, the Galaxy Watch Active does not feature MST (Magnetic Secure Transmission) support, which is a more secure way to pay than using a traditional payment card. The main problem with MST and NFC technology is that the former is accepted at nearly all payment terminals with a card reader, whereas the latter requires old terminals to be updated, which means not all merchants may have NFC-enabled payment terminals. Obviously, the Galaxy Watch Active will feature built-in GPS, but the specs list also mentions that it will include a speaker, something that the Gear Sport doesn't have. That's probably meant to be used with Bixby, at least that's the only thing that comes to mind. Last but not least, Samsung may launch a dual eSIM model, but that piece of information hasn't been confirmed by the data hauled from the firmware files, so let's just take it as a rumor for now. Apparently, Samsung Galaxy Watch Active will run Tizen 4.0, a new version of Samsung operating system for wearables. It remains to be seen whether or not the smartwatch will be introduced at MWC 2019 trade fair, although we believe it will be revealed along with the next Galaxy Note flagship. Smaller battery lol no thanks. But NFC is king especially here in the UK & Europe. My 46mm Galaxy Watch battery performance is perfect. With AOD it lasts fir 2 whole days with heavy use !